The Pinellas Park Patriots came in to East Lake on a roll. Having won their first five games to start the season, they were hoping for their high-scoring offense to keep the streak going. 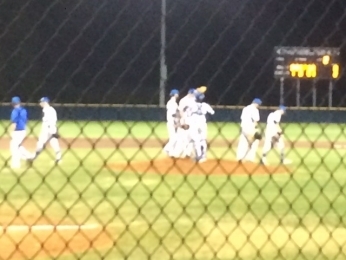 East Lake had other ideas, however, as senior pitcher Christian James threw seven innings of four-hit, shutout ball to give the Eagles the 2-0 win. Second baseman Reid Zitzelberg provided all the offense East Lake would need, going 2-for-3 and scoring both of the Eagles’ runs, the second on a towering solo home run to left in the sixth inning. Zitzelberg added two stolen bases for the Eagles, who improved to 4-2 on the season. Pinellas Park moves to 5-1. The scoring started in the bottom of the first after a double down the right-field-line by junior first baseman Jakob Sessa. Reid Zitzelberg followed with an RBI single, scoring Sessa from second base. Patriots pitcher Triston Allen labored through the inning, facing six hitters and throwing over thirty pitches. He settled down after that, throwing four scoreless innings before giving up the leadoff home run in the bottom of the sixth to Zitzelberg. Allen gave up two runs on six hits and walked one East Lake hitter. Eagles senior Christian James tallied the win by striking out 11 in seven innings and giving up no runs on four Patriot hits. James is slated to play for Florida International next season. Roper was quick to praise his defense as well, singling out junior catcher Seth Caballes. Pinellas Park put up singles in each of the first four innings, but good Eagles’ pitching and outstanding defense kept them from posing a threat.